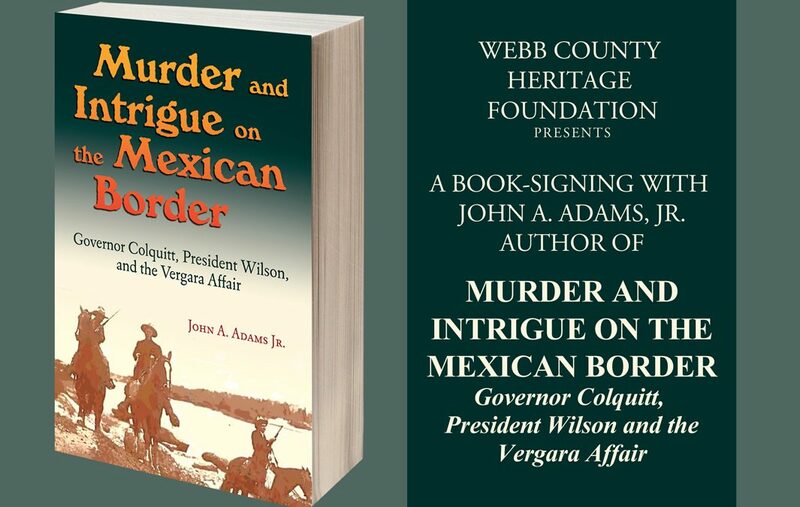 Laredo, TX – The Webb County Heritage Foundation will host a book-signing for John A. Adams, Jr., author of Murder and Intrigue on the Mexican Border – Governor Colquitt, President Wilson and the Vergara Affair, on Thursday, September 20 from 6 to 8 p.m. at the Villa Antigua Border Heritage Museum, 810 Zaragoza St. in Laredo. A presentation by the author will take place at 6:30 p.m. Books will be available for sale that evening. According to publisher’s notes: “In early 1914, Clemente Vergara discovered several of his horses missing and reported the theft to local authorities. The Webb County sheriff arranged for the South Texas rancher to meet with Mexican soldiers near Hidalgo to discuss compensation for his loss…Days later, his body was found hanging from a tree. John A. Adams, Jr., formerly of Laredo, is the author of numerous books including Conflict and Commerce on the Rio Grande: Laredo, 1775-1955. He resides in College Station, Texas.